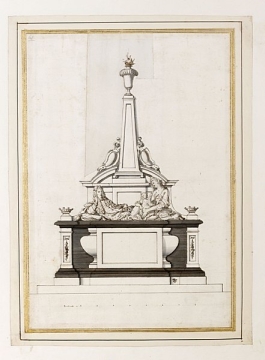 Design for a monument to Viscount Irvin of Temple Newsam, at St Mary's church, Whitkirk, Leeds. You are here: CollectionsOnline / Design for a monument to Viscount Irvin of Temple Newsam, at St Mary's church, Whitkirk, Leeds. 1 foot to 27/32 inches approx. In pen and brown ink, by John Talman, on plinth at bottom right, with triple-T collector's mark; and in pencil, on verso, by Nost (? ), at bottom left, partly cut off by trimming of sheet, ye Drapery / L, and at bottom right, similarly cut off, with / Drap [ery]; and John Talman, with star-shaped collector's mark. A connection between this design and the monument to the 9th Viscount Irwin (d.1688) at the Church of St Mary, Whitkirk, Leeds, was first made by Mrs Esdaile in a pencilled note on the mount of the drawing in the 1920s or 1930s. An addendum in N. Pevsner and E. Radcliffe, The Buildings of England: Yorkshire West Riding, 1967, p. 640, states 'Letters recently discovered among the Temple Newsam archives prove that the Irwin monument is by John van Nost and was erected in 1697. (Leeds Arts Calendar, No. 50 (1962).) The tomb-chest has recently been removed, and this impairs the proportions of the setting (information from C. G. Gilbert)'. The monument is in the south chapel of the chancel of the church, and was erected to a modified design, without the tall obelisk in the 'reredos' background, and with the group of three figures (the Viscount, his wife, and their only daughter who died aged two) differently arranged, with the daughter to the Viscount's right.The design is for a tomb-chest monument with recumbent figures and a 'reredos' background. The tomb chest is treated as a broad pedestal base, rendered for black and white marble: black (ruled brown lines on grey wash) for the cornice and basement mouldings and plain dado and white (plain paper) for the central panel, framed by the bulbous ends of a sarcophagus. Either side are white marble pilasters with foliage drops in their recessed panels. The whole is raised on a white sub-plinth and a single step. Above the pilasters and flanking the effigies are viscounts' coronets on socle bases. The recumbent viscount on the left is half raised on a tasseled cushion, looking towards his seated wife who has their daughter in her lap. Behind is a low panel with a central projecting pedestal carrying a tall obelisk, which rises between two halfs of a broken segmental pediment. Curved strapwork cartouches lean against the sides of the obelisk, forming a pyramidal profile with the obelisk. On top of the obelisk is an urn with a broad, gadrooned rim. Flames have been added to the urn in lighter brown ink, drawn on the light paper insert, cut and pasted into the sheet to the left and upper right of the obelisk. The alteration was probably made to remove the Drapery L[eft], referred to in the inscription on the back of the sheet. This inscription is in a contemporary hand, noteworthy for the use of a double-footed secretary 'r' after the 'D'. It appears to be a memorandum about drapery hanging down on the left side of the obelisk, which Pearce decided to remove by cutting out a section from the drawing. The note on the right, with Drap[ery] describes the option of drapery shown on this side of the drawing (the left side of the recto). The drawing displays characteristics of the hand of Edward Pearce and compares closely with an alternative design for this monument by Pearce in the 'Bull Collection' in the British Museum, which, like this one, has a provenance in William Talman's collection of drawings; see Wren Society, XVII, pl. 22, top. Both drawings have an identical style of scale bar. In the British Museum alternative the couple are on a two-stage sarcophagus, the viscount above his wife. A pedestal bearing an urn rises behind the viscount and is framed by a drapery canopy. It is known that John [van] Nost completed the monument in 1697. On this evidence of this drawing, it would appear that the design was begun and put in hand by Pearce, and then finished by Nost after Pearce's death in 1695.